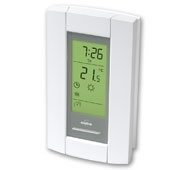 This high-capacity TRIAC thermostat with a remote input combines unbeatable accuracy and silent operation. This stylish thermostat offers great flexibility, allowing up to four different settings to be programmed for each day of the week individually. Other features include a microprocessor-optimized temperature control with 15 minute cycles to deliver superior comfort, a heating command indicator for at-a-glance verification of the power being delivered, an early start function to insure the desired temperature is reached at the desired time, and a pre-programmed energy-saving schedule to faciltate quick set-up. The LCD display permits either 12 or 24 hour format, and temperature in either Fahrenheit or Celsius. For four wire double pole installations. Dimensions: 4.89" x 2.76" x 0.91"